1 Fishing spiders live near ponds, swamps, and slow-moving streams. 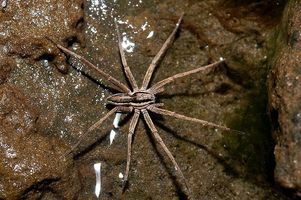 Fishing spiders are also called raft spiders, dock spiders, or wharf spiders. Fishing spiders can be quite big. Their bodies might be one inch in length. Their leg span can reach between three and four inches. Fishing spiders are usually a dark brown or gray color. Many fishing spiders have a white stripe on each side of their bodies. 2 Fishing spiders are nocturnal carnivores. They are meat-eaters and hunt at night. They mainly eat insects. Sometimes they eat minnows, tadpoles, or other small fish. Fishing spiders don't have webs. They sit by the edge of the water and wait for their prey. They stick their front legs out on the water. They feel vibrations in the water. The ripples on the water show the fishing spiders where the prey is. Even though fishing spiders have eight eyes, their sense of touch is more important than sight in locating prey. 3 When fishing spiders dart across the water to catch the prey, they look as if they are walking on water. They can move across the top of the water due to surface tension. The spiders have short hairs that repel water. They have long legs. Their bodies are lightweight. All of these things help the spiders to move across the water without sinking. They use the small claws on their front legs to grab their prey. They can also dive beneath the surface of the water to catch their prey.